Debbie Beere at Dbeere Yachts has sold her central listing for sale, the 32 metre motor yacht Moliver, with Rick Obey & Associates representing the buyer. Previously named Soulseeker, she was built in GRP by UK yard Sunseeker International as a Sunseeker 105 model and is the only yacht from the yard to be built to Lloyds class, with delivery in 2004. A custom design by Ken Freivokh saw her interior completed with black American walnut satin wood cabinetry and paneling throughout, complemented by soft furnishings of exquisite detail and quality. MCA compliant, the accommodation consists of eight berths in four cabins plus five crew berths in three separate cabins. On the lower accommodation deck there’s a stunning full beam master cabin aft with double bed, walk-in wardrobe and full en suite facilities including a spa bath. Two twin berth guest cabins to port and starboard each have full en suite bathroom facilities. On the main deck is a VIP guest cabin, again with its own en suite. 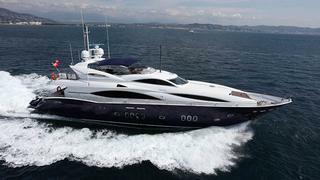 Twin 2,000hp MTU engines give Moliver a cruising speed of 20 knots and her asking price was €2,495,000.